Note from Storm: This is part of a series of occasional Guest Articles from leading thinkers in the world of urban/rural regeneration, natural resource restoration, and economic resilience. 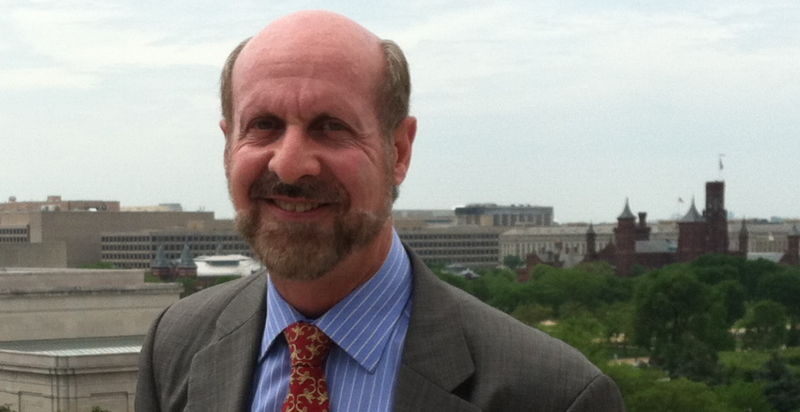 Our guest writer for this issue of REVITALIZATION is Rick Rybeck, Director of Just Economics, LLC, a Washington, DC firm that helps communities harmonize economic incentives with public policy objectives for job creation, affordable housing, transportation efficiencies and sustainable development. From time to time, there will be media attention about crumbling infrastructure in the USA. According to a 60 Minutes report in November 2014, most politicians, corporations, business interest groups and labor unions recognize the importance of infrastructure in maintaining our economic competitiveness, both at home and abroad. But, nobody can agree about how to raise the funds to repair and renew roads, runways, railroads, ports, etc. FIRST, when infrastructure works well, it is almost invisible and people take it for granted. You turn on the faucet and water comes out. You get in your car and then arrive at your destination. We hardly think about the treatment facilities, pipes and valves that supply our water. Neither do we think about the pavement, the traffic signals, the street lights, the pavement markings and all of the other street-related facilities and services that make our car trips possible — unless they don’t work. SECOND, in many cases we have divorced payment for infrastructure from its consumption. When we pay our income and sales taxes, we don’t have a clear understanding about how the money is spent — on infrastructure or anything else. And because it often appears to be free to use streets and highways, we drive and park in congested places at congested times more than we would if we had to pay the true costs of doing so. THIRD, when infrastructure is well-designed and well-implemented, it often inflates the price of well-served land. So after paying taxes for highways or transit, if we want to get the most value out of them, we want to have our homes or businesses near a highway interchange or a transit station. But the price of land near these facilities has increased as a result of that new infrastructure. So now we must pay a landowner a premium rent or price to have access to the land that our taxes made more valuable in the first place. This compels many of us to locate our homes and businesses at cheaper, but more remote sites where we don’t have access to the infrastructure that we have paid for. And when enough of us locate at these remote locations, infrastructure is extended there (at great expense) only to have the cycle start again and have development pushed even farther away. Thus the infrastructure we create to facilitate development pushes development away and is partly responsible for sprawl. Not only does sprawl harm the environment, but its wasteful duplication of infrastructure facilities and services wastes our tax dollars and cripples our state and local budgets. Often we hear politicians say, “We are funding this infrastructure to facilitate development and create jobs.” But then, high land prices make development difficult. While most families and businesses must relocate to cheaper and less productive locations, big developers go to politicians looking for land write-downs, property tax abatements or other subsidies. Then we hear the politicians say, “We are subsidizing this development because, without this subsidy, there would be no jobs and no new tax revenues whatsoever.” Isn’t job-creation the reason we paid for the infrastructure initially? Yet now it appears that we don’t get those jobs unless we pay an additional subsidy so that developers can pay off the landowners. Paying twice for infrastructure and paying twice to foster jobs does not make the public happy or enthusiastic about paying for more. FOURTH, while politicians love ribbon-cutting ceremonies for new infrastructure, they don’t get public acclaim when they appropriate funds for infrastructure repair, restoration or renewal. But keeping taxes low is always going to be a political winner. First, an increased reliance on user fees can help reconnect consumers with what they are consuming. For example, most of us pay for water and sewer services through a per-gallon charge on the water that we consume or flush. When we have a leaky faucet, we don’t just see water going down the drain. We see our money going down the drain and this motivates us to fix the leak and to conserve water generally. Of course, we could pay for water and sewer services out of a sales tax. But would we be as motivated to fix a leak? Would we make an additional and unnecessary purchase to provide sales tax revenue to compensate the water authority for the water we are wasting? Probably not. In the transportation arena, mileage-based user fees (adjusted for congestion, vehicle weight & pollution) would reduce congestion and make payment related to costs we impose upon others. Performance-based parking fees (as suggested by Professor Donald Shoup) would also go a long way toward improving transportation behavior. And mileage-based roadway charges would encourage families and businesses to locate closer to the activities that they engage in on a daily basis. This could help curtail sprawl by motivating infill development. This would make walking, cycling, car-sharing, carpooling and transit more convenient. Thus, properly designed user fees could encourage more efficient land use patterns that would be beneficial to the environment and our pocket books while wasting less of our time in traffic jams. General public pays taxes to generate and maintain public goods & services. * Owners of prime sites contribute less than others because most of their taxes are passed through to tenants and consumers. Most land values created by government are windfalls to owners of prime sites who charge premium rents to tenants for the right to access these public goods and services. NOTE: Tenants pay twice for government services. Once in taxes & again in land rent. Let’s return to the water and sewer example. The owner of a vacant lot isn’t drinking or flushing any water at that site. Should the owner pay anything to the water and sewer authority? Imagine a thriving town with unmet demand for housing and business space. There are two vacant lots of the same size. They have the same zoning and equally convenient access to the downtown and all of the public and private amenities except that “Lot A” has water and sewer pipes at the property’s edge and “Lot B” does not have water and sewer pipes within a half mile of the property. Which property is more valuable? “Lot A” is more valuable. But not because of anything that the owner did. “Lot A” is more valuable because the water and sewer authority created (and maintains) water & sewer pipes at the property’s edge. 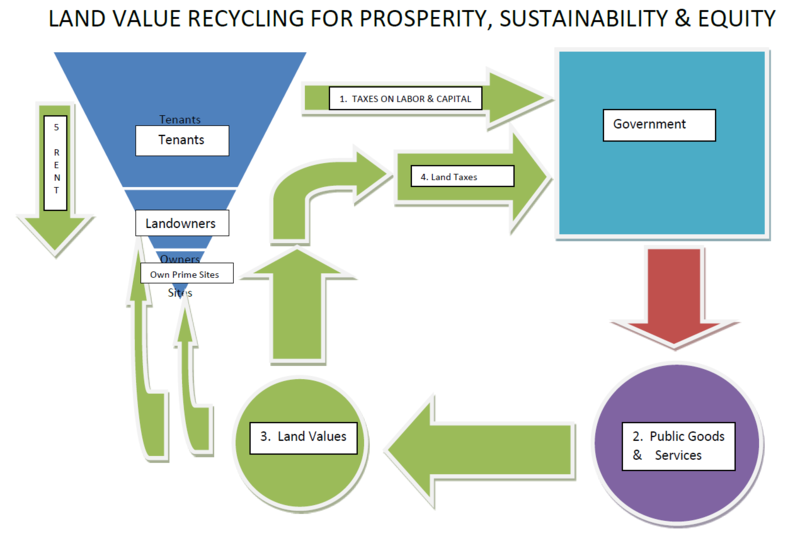 Value capture consists of techniques to return that publicly-created land value to the public entity that created it. A good example of the balance between user fees and value capture was created in the 1890s. At that time, the Chevy Chase Land Company (CCLC) bought about 1,700 acres of land on both sides of the border between Washington, DC and Maryland. This land, mostly farms and woodland, was very cheap because it did not have good access to the downtown where the jobs and shops were located. CCLC, at its own expense, built a streetcar line out Connecticut Avenue connecting its landholdings with the downtown. They charged people a few pennies to ride it. CCLC did not recoup its costs through the farebox. CCLC recouped its costs (and more) through the higher prices that they charged for home lots and business lots that were now accessible to the downtown via convenient and affordable transit. It is important to note that if CCLC had attempted to recoup all of its costs through the farebox, the fares would have been so high that nobody would have ridden it. Thus, if CCLC had attempted to recoup costs only through fares, both the streetcar and the land development projects would have failed. Today, some communities are using value capture to transform their property tax into a value capture fee by reducing the tax rate on privately-created building values and increasing the tax rate on publicly-created land values. The lower tax on buildings makes buildings cheaper to construct, improve and maintain. This is good for residents and businesses alike. a. Owners of prime sites contribute more than before. 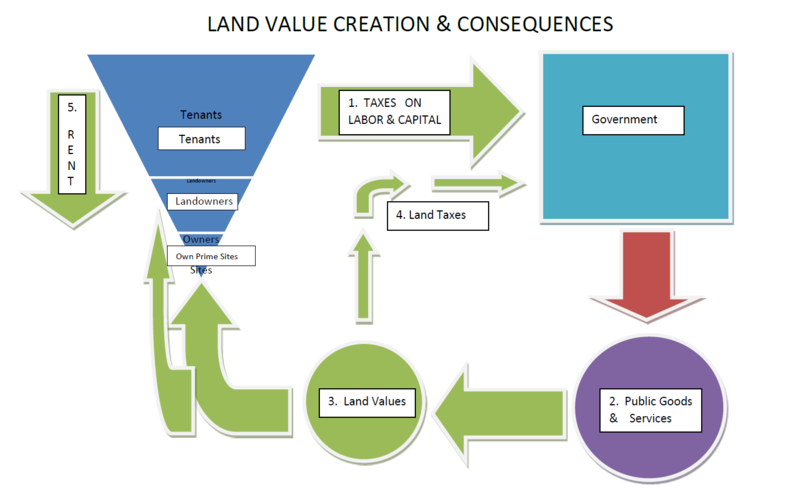 Taxes on land values are not passed through to tenants and consumers. Reduced windfalls to private landowners reduce land prices and reduce land rents from tenants to landowners. Reduced taxes on buildings make buildings more affordable, so tenants get more value for the building rents that they pay. Additionally, value capture motivates the development and renewal of high-value locations. These tend to be infill sites near existing urban infrastructure amenities like transit and parks — and this is exactly where we want development and renewal to occur. And the more we develop and renew infill sites, the less demand will exist for premature development of remote areas that are more appropriate for agriculture, conservation and recreation. As mentioned above, curtailing sprawl is good for the environment, it boosts productivity, and it reduces the extensiveness (and expensiveness) of the infrastructure required to satisfy homes and businesses, thereby reducing tax burdens. In 1972, Harrisburg, PA was devastated by flooding from Hurricane Agnes. Combined with the urban flight that was occurring nationwide, Harrisburg ended up with over 4,000 vacant and boarded-up properties in its downtown. It was designated as one of the worst cities in America. In the mid-1970s, Harrisburg adopted a split-rate property tax whereby the tax rate on privately-created building values was reduced and the tax rate on publicly-created land values was increased. After 10 to 15 years, the number of vacant and boarded-up properties was reduced to a few hundred. And this occurred well before the “back-to-the-city” movement of recent years. After its regeneration, Harrisburg became known has one of the most affordable and livable cities of its size. In Pennsylvania, between 15 and 20 communities have implemented this approach to property taxation. Pittsburgh and Harrisburg are the largest cities to have done so. You can learn more about this concept and the experience of these Pennsylvania cities by checking out a 2012 article in Public Manager Magazine, Break the Boom and Bust Cycle. Just Economics also helped write model legislation to authorize and implement the transformation of the traditional property tax into a value capture fee. Infrastructure creation, maintenance and renewal is complex. We need the right projects in the right places. Project design is crucial as well. And then there’s the question of funding. But there’s more to infrastructure funding than merely coming up with the money. How we raise funds is just as important as the amount of money we raise. For communities that seek to restore, renovate, revitalize, repurpose, renew and reconnect, a more widespread application of user fees (for roads, parking, storm-water runoff, etc.) is an important part of the equation. Value capture is almost always overlooked in spite of its potential to provide significant, fair and comprehensible funding for essential infrastructure investments. Finally, the solution for many transportation problems is less related to transportation and more related to land use. A properly designed and balanced system of user fees and value capture can allow communities to develop, revitalize and renew themselves within a more compact area, reducing sprawl and promoting more efficient land use that is beneficial for the environment, our economy and our public and private pocket books. Restoration Economy Report: Ecological restoration hits $9.5 billion/year in U.S.